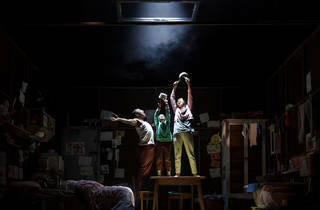 But Donoghue, writer of both book and the movie, has now worked with a team including director-musician-lyricist Cora Bissett and musician-lyricist Kathryn Joseph to turn her story into a moving play that’s reinforced with sombre, sensitive songs that have quiet hints of gospel or even David Bowie at his most melancholy. 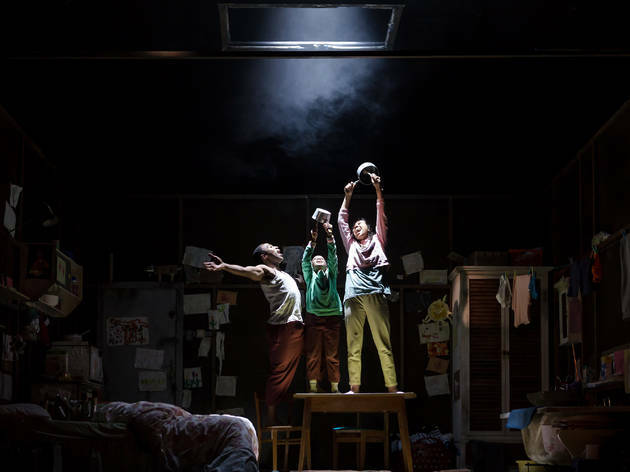 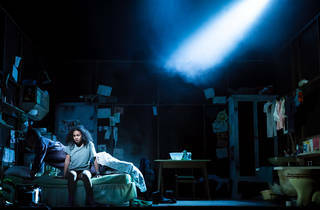 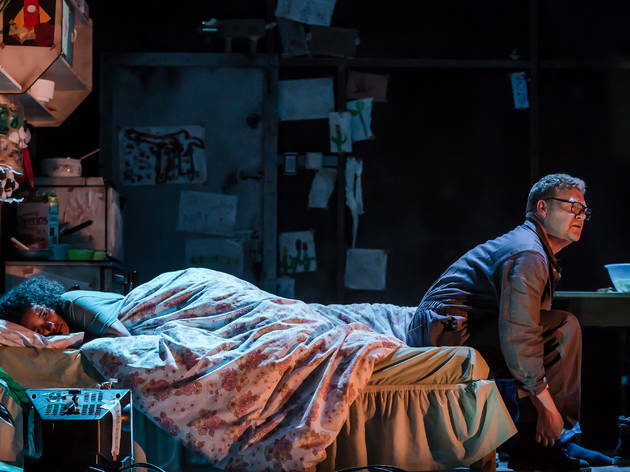 Several things about ‘Room’ lend it to the stage: the extreme sense of space inspired by this harrowing story (first confinement in one room and then release into the ‘normal’ world); the story’s stark two-act structure; the intimacy and tension of the relationship between Ma (an excellent Witney White) and Little Jack; the strangely magical inner voice of the boy commentating on the world as he sees it. 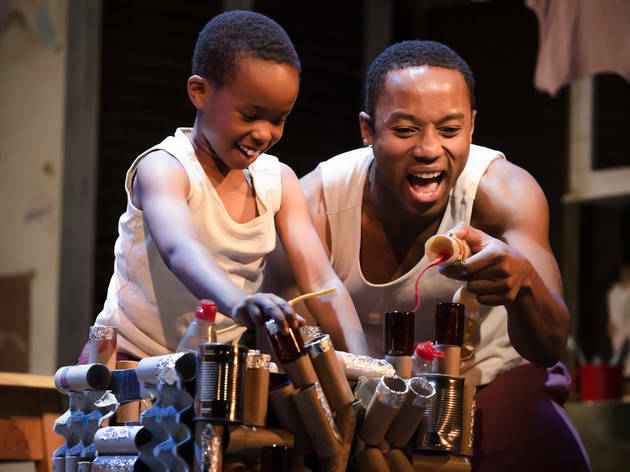 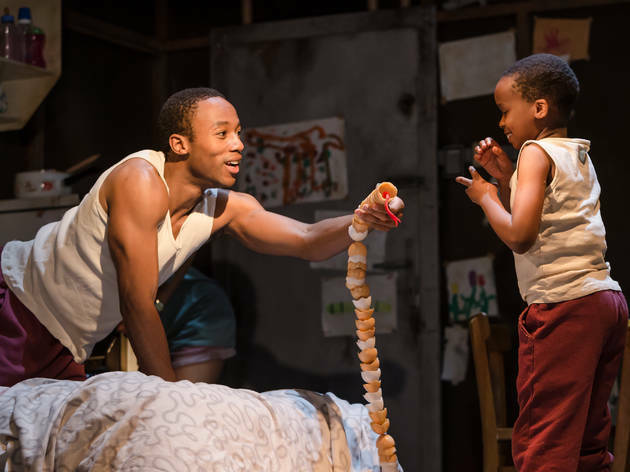 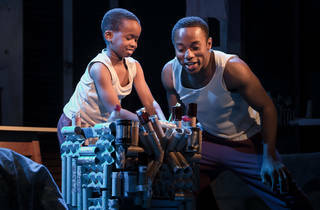 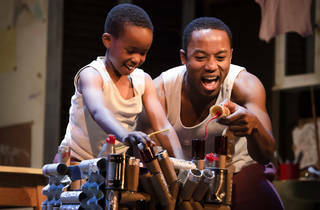 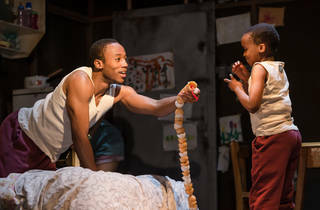 That last element is especially well served by Bissett’s production: an older version of Jack (a soothing Fela Lufadeju) follows Little Jack (played at different performances by Darmani Eboji, Taye Kassim Junaid-Evans and Harrison Wilding – Eboji did a very endearing job the day I went) and narrates his perspective on the world, allowing Donoghue the playwright to hang on to the voice from the novel, which was told from the boy’s point of view. 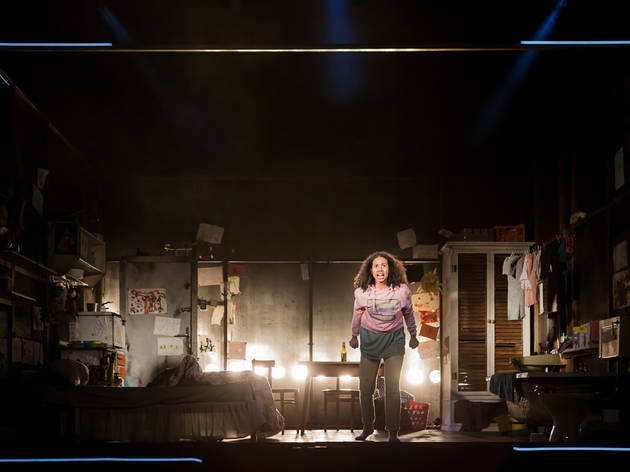 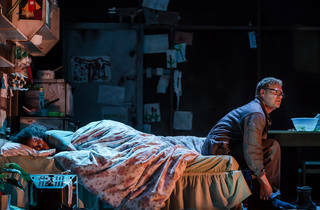 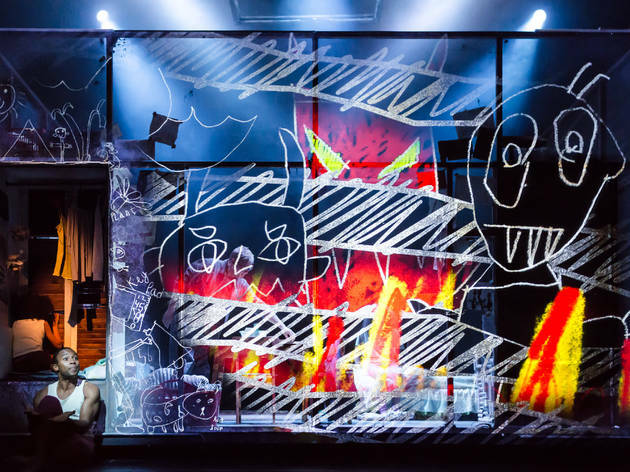 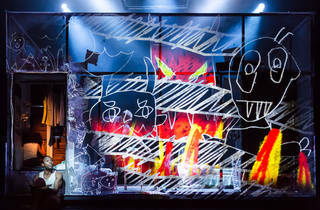 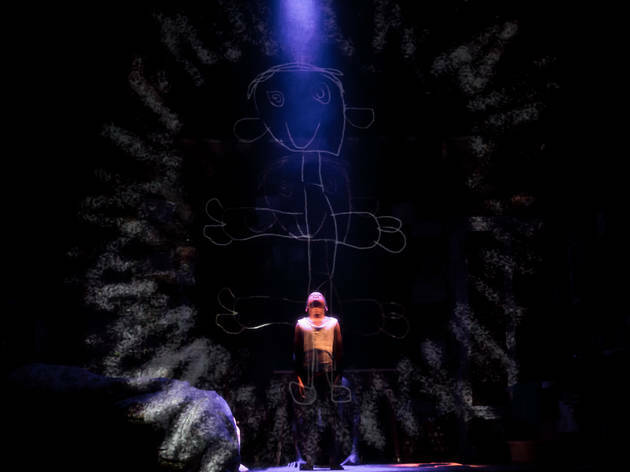 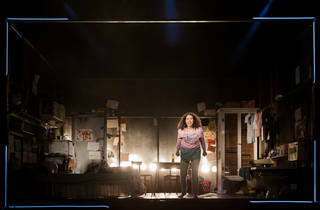 Lily Arnold’s design contributes strongly to this show’s power: she makes sense of the claustrophobia of the room itself by using a revolving stage to allow us different views on it, while the family home to which Ma and Little Jack return in the second act is spookily large, skeletal, full of air and lacking in life, dwarfing the cast within it – which is a little problematic in some of the play’s second half which feels a little underpowered at first, compared to the force of what’s come before. 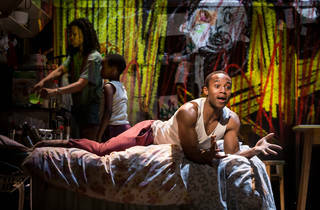 But especially interesting about this production is how it speaks, subtly but pointedly, to the wider experience of slavery. 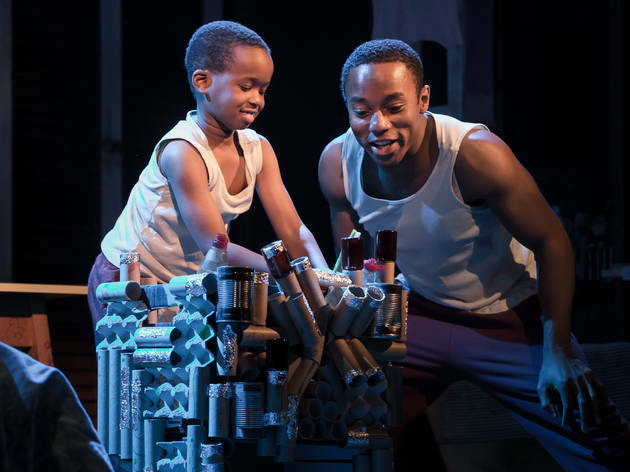 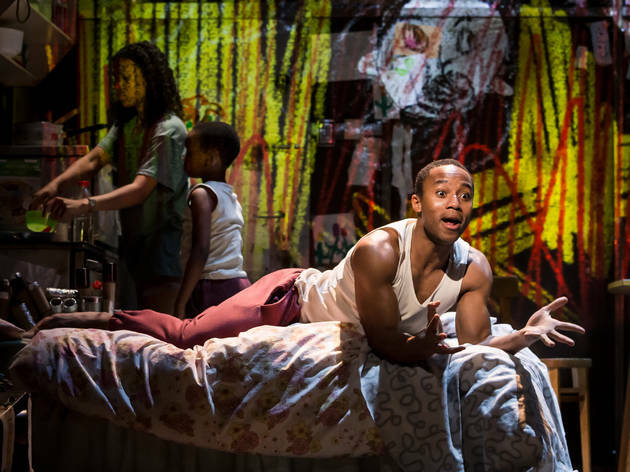 Both Ma and Little and Big Jack are played by black actors; Old Nick (Liam McKenna) is white; and Ma and Jack sing or hum slavery-era spirituals (‘Swing Low, Sweet Chariot’, ‘She’ll Be Coming Round the Mountain’) as part of their daily survival routines while in captivity. 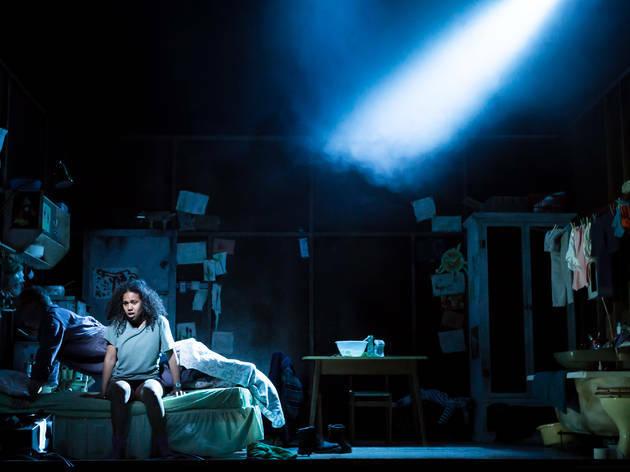 All of which helps to make a good case for ‘Room’ as vital, imaginative theatre rather than hackneyed theatrical adaptation.